There are a number of reasons why you may choose to use synthetic or artificial turf in your garden instead of real grass. One of the main reasons is that synthetic turf is a lot easier to manage than natural grass. It requires less maintenance and work; you won’t need to fertilize, mow, or use huge amounts of water in order to keep your grass green. 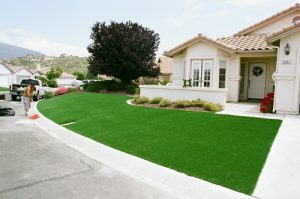 However, with this in mind, you must understand that artificial turf is not completely maintenance-free. How much work is entailed depends entirely on your specific artificial grass situation. For example, if you have pets, children, or lots of trees and plants, you will likely need to clean your synthetic lawn quite often. If you live in a particularly dusty area, such as in a city or busy suburb, this may also require you to rinse down your artificial lawn more frequently. However, during rainy months, you can allow the rain to wash your lawn and may not need to spray it down! Usually, most homeowners will need to gently rinse their synthetic lawns once per week. It’s very straightforward; simply spraying the grass fibers with a hose will remove the dust and debris that has accumulated. Sometimes you may find there is more debris than usual – this can be due to seasonal changes. If you find that there are excess leaves, dirt, or other bits of debris, you can use a rake to get rid of these in no time. If you would like to find out more about how we can help you when it comes to your artificial lawn, simply pick up the phone and call the experts at Blooms Landcare at (817) 688-5352.